The transitional program is also organically linked — this is something we learn from the inheritance of the third and fourth congresses of the Communist International and the subsequent elaboration by Gramsci and Togliatti [link] — to the goal of the united front, the rallying of all the forces of the block of the subordinated classes at a higher political and strategic level. It was this unifying approach implicit in the idea of a “government of the anti-austerity left” that fired the imagination of broad masses in spring 2012, enabling Syriza’s rise. The link in the quote above directs you to another Jacobin article about Togliatti written by Peter D. Thomas who apparently thinks that Perry Anderson was a bit off on Western Marxism, especially by including Gramsci. I don’t think that Anderson was off at all by claiming that the Gramsci industry in academia represents a detour into cultural studies but let’s leave that aside for the time being. What I don’t get is Thomas and Kouvelakis’s enthusiasm for Togliatti, especially the latter’s linking him to transitional demands unless he is talking about something totally unrelated to Trotsky’s writings. I also think that Marxist theory in this period needs to be understood integrally and politically, that is, not simply in terms of theoretical productions (essays, books, etc. ), but also in terms of the political impact of theoretical work. In that sense, the greatest Western Marxist theorist of the postwar period is not Sartre or Althusser or Colletti or any of the other figures discussed at length by Anderson, but instead, Palmiro Togliatti. In addition to his own theoretical writings — of much greater value than is often supposed today — Togliatti was also a theoretician of politics engaged in creating a hegemonic apparatus that encouraged a profound and real dialectic and real critique of the politics of his period. Whatever disagreements I might have with his substantive theoretical and political positions — and there are many — this should not preclude acknowledgment of his real importance as a theorist and politician with a real, mass impact on the politics of his time. The theoretical and political culture that Togliatti helped to shape in the Italian Communist Party, and in Italy more generally as this massive party’s sphere of influence radiated across the entire spectrum of the Left, was the example to which other leftists in Europe and around the world looked for inspiration. All I can say is that if you are interested in the role of the CP in Italian politics, you are better off reading Paul Ginsborg’s “A History of Contemporary Italy: Society and Politics 1943-1988” than this balderdash because after all you have to judge socialists on their deeds much more than their “theory”. However, the most insidious elements of Stalinism were not the aberrant judgements on Stalin himself or the Soviet Union, but the attitudes that permeated the life and activity of the party at home. The tradition of uncritical adulation of leaders was only too easily transferred to Italy, where Togliatti seemed happy to allow absurd tributes to be paid to him by lesser comrades and exaggerated stories of his role in the early history of the P C I to be published in the party press.45 The habit developed, and even the finest brains in the P C I like Amendola and Ingrao indulged in it, of citing the writings of the historic leaders of the party, Gramsci and Togliatti, as if they were biblical texts to serve as sermons of the day. In American popular culture, the mafia gangster is either a tarnished hero like Don Corleone or a likeable lowlife like Tony Soprano. But for Italians, he is a much more malevolent figure especially as seen in a number of art films that are often infused with the leftist and neorealist traditions of the postwar period. More importantly, it is much harder for the average Italian to cheer for Michael Corleone taking revenge on a crooked cop and rival gang leader or Tony Soprano’s malapropisms when the mafia has functioned so often as a rightwing death squad. In Paul Ginsborg’s Marxist-oriented “A History of Contemporary Italy: Society and Politics 1943-1988”, there’s an account of the mafia’s attack on a peasant protest in Villalba in central Sicily in September 1944. This was a village dominated by a mafia boss named Don Calò Vizzini, who had returned as part of the Allies entourage. Vizzini was among the gangsters who supposedly helped prepare the American invasion alongside Lucky Luciano and others. Causi began to talk to that little unexpected crowd about the Micciché estate, about the land, about the Mafia. The parish priest, brother of Don Calò, tried to drown Li Causi’s voice by ringing the bells of his church. But the peasants listened and understood: ‘He’s right; they said: ‘blessed be the milk of the mother who suckled him, it’s gospel truth what he is saying.’ By so doing they were breaking a sense of time-honoured servitude, disobeying not just one order but order itself, challenging the laws of the powerful destroying authority, despising and offending prestige. It was then that Don Calò,. from the middle of the piazza, shouted ‘it’s all lies!’ The sound of his cry acted like a signal. The mafiosi began to shoot. Fourteen people were wounded that day, including Li Causi. There was peasant resistance in Calabria as well, the “toe” of southern Italy that appears to be kicking the island of Sicily. A 1945 CP report indicated that they had built peasant leagues with 40,000 members in Calabria, the very region that is the locale for “Black Souls”, an Italian film that opens at the Angelika and City Cinemas in New York tomorrow and at the Nuart in Los Angeles on April 24. The blackness alluded to in the title is not skin color but the evil that dwells in the heart of brothers Luigi and Rocco Carbone. The two gangsters come from the town of Africo in Calabria, where their older brother Luciano raises goats on a picturesque mountaintop. Luciano’s son Leo, who is in his late teens, wants nothing to do with goats and only dreams of becoming an apprentice to Luigi and Rocco who run their drug importing business out of Milan. When a traditional rival of the Carbone family, a local saloon-keeper in Africo, insults them, Leo arms himself with a shotgun and blows out his windows in the middle of the night. This is hardly the kind of offense that leads to gang wars of the sort that dominate American films but is in fact typical of what has turned much of southern Italy into a blood-soaked battleground. If you are expecting Godfather type action of the “going to the mattresses” sort, not only won’t you find here but you shouldn’t. The violence in “Black Souls” is like that takes place over turf control by the Crips and the Bloods or the kind that has forced so many young people to flee El Salvador and Honduras. It is Luciano’s hope to dissuade Leo from a life of crime even though he knows it is a losing battle. The boy worships Luigi who is both charismatic in his own slimy fashion as well as filthy rich. “Black Souls” is based on a novel written by Gioacchino Criaco, who was born in Africo and a lawyer who returned home to write about his region’s troubles. Like Juarez in Mexico, Africo is one of Calabria’s most dangerous spots. The film benefits from the casting of Giuseppe Fumo, a local nonprofessional, as Leo. He must have known from first-hand experience the tragic attraction that the mafia has for youth with an uncertain future. Criaco is far more interested in the family drama that pits brother against brother for the soul of a young man than in the social and economic forces that have given birth to the mafia. Before long, I will be researching Italian films about the mafia that draw from radical and neorealist traditions but do not hesitate to recommend “Black Souls”, a film that is uncompromisingly bleak but truthful. It is blessed by a good script and fine performances. There’s not much more than one can ask for nowadays. I should say, regarding my unfamiliarity with the material I was discovering at the Biblioteca Nazionale, that I did have a slight acquaintance with the history of Italian Fascism. It was not, to be sure, anything that helped me very much to understand the vicissitudes of Pratolini’s life and work; it was a small piece of historical evidence that had made me aware of the worldwide influence, the rayonnement, of the Italian Fascist regime. I’m referring to the extremely close, mutually supportive association that existed for close to twenty years between Mussolini’s government and Columbia’s Casa Italiana, several of whose professors were enthusiastic advocates in their youth of the Fascist regime. Two of the professors with whom I had done my course work, Peter Riccio and Howard Marraro, had strong Fascist sympathies in the 1930s, when they were themselves young candidates for Ph.D. degrees. In their early years both had written books that proposed a socially progressive, politically dynamic interpretation of what Mussolini and his cohorts were trying to accomplish. I recall reading these autobiographical writings with considerable dismay and keen interest. My personal contact with Professors Riccio and Marraro were pleasant enough. They were both friendly, approachable men, with none of the authoritarian traits that I probably expected to see in them, given their early attraction to Fascist ideology. Nicholas Murray Butler was president of Columbia University at the height of Mussolini’s popularity in the United States. A friend of Theodore Roosevelt, an accomplished diplomat and philosopher, and a widely traveled man, like many Americans in the 1930s he was impressed by Mussolini’s grandiose plans for Italian development, which he apparently viewed as, if nothing else, good for the Italian people. But it seems that there was another more immediate and practical reason why he expressed positive views of the new Italian order. 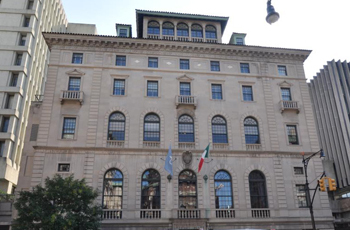 In the 1930s Columbia’s office of development was trying to cultivate relationships in the Italian-American community for the purpose of expanding the Italian program at Columbia. They succeeded in this effort: The building of the Casa Italiana was paid for in part by contributions from well-heeled Italian-American businessmen, several of whom were sympathetic to Fascism. In an effort to discredit The Nation’s charges, officers of Columbia’s Graduate Club of Italian Studies announced that the club was inviting Gaetano Salvemini, a distinguished historian exiled by Mussolini who was teaching at Harvard at the time, to speak at the Casa Italiana. Salvemini replied to the Graduate Club that, considering The Nation’s charges, he would accept the offer only if Professor Prezzolini, as the Casa’s director, personally agreed to invite him. He also asked that the Graduate Club inform President Butler of his request, so that he could not dodge responsibility. But Prezzolini refused to invite Salvemini. He explained to the Graduate Club that Professor Salvemini was a “political trouble-maker” whose only purpose in lecturing at Columbia was “to stir up some trouble.”59 As a result, Salvemini, the leading Italian spokesperson for anti-fascism in the United States during the 1930s, never spoke at the Casa Italiana. From April sixteenth to May seventh, the Museum of Modern Art is presenting a retrospective of the work of Italian director Marco Bellocchio, one of the great film directors of the Italian left. As with Bertolucci, Pasolini, Visconti and Pontecorvo, Bellocchio’s films are intensely political as well as artistic triumphs. Born in 1939, Bellochio, a friend of Pasolini, joined the Maoist Union of Italian Communists (Marxist–Leninist) in 1968, a sect whose newspaper bore the title popular in those circles: “Serve the People”. His motto would ultimately be “Serve the Audience”. Bellocchio was always far more interested in human drama than propaganda. Made one year before he joined the Maoists, the narrative film “China is Near” is anything but propaganda if you take Pauline Kael at her word (and who wouldn’t?). She describes the film’s Maoist anti-hero Camillo, who is committed to sabotaging his older brother’s campaign for municipal office on the Socialist Party ticket, as a “prissy, sneering despot” and “a seventeen-year-old seminary student turned Maoist who looks the way Edward Albee might look in a drawing by David Levine.” The film derives its title from graffiti scrawled by Camillo on the walls near his brother’s campaign HQ. If you have access to Hulu Plus, I recommend a look at “Fists in the Pocket”, Bellocchio’s debut film. Made in 1965 when he was only 26, it is deeply influenced by Godard and Buñuel. Like “China is Near”, the film is about a family at war but the story has only a tangential relationship to Italian society. Living in a decrepit villa in the Italian Alps, a blind matriarch has four grown children living under the same roof with her. A good Catholic, she tries to maintain her sanity in the face of nonstop quarrels, often turning violent, and tearful reconciliations among her troubled brood. The oldest son is the only one gainfully employed, while his younger sister and two younger brothers spend their days alternating between juvenile pranks and coping with the epileptic seizures that run in the family. Alessandro, one of the younger brothers, has the devilish soul and self-loathing of a Karamazov brother. He plots to kill his mother, himself and his two other epileptic siblings in order to allow the oldest brother to live a normal life. I should add that this is a comedy and a very good one at that. Marx’s Lesson for the Muslim Brothers? Groucho’s, I assume. It is not every day that you find an op-ed piece in the NY Times proffering what appears to be Marxist advice. In this instance I am not speaking of Paul Krugman’s endorsement of Michael Kalecki that amounted to dipping his big toe into the Marxist pool. After all, there is some question as to how to categorize Kalecki, some seeing him as a post-Keynesian rather than a Marxist. Krugman reflects this uncertainty when he writes: “Kalecki was, after all, a declared Marxist (although I don’t see much of Marx in his writings)”. In this instance I am referring to Sheri Berman’s op-ed piece in the Sunday, August 11, 2013 NY Times titled “Marx’s Lesson for the Muslim Brothers”. Since Berman is an unabashed social democrat on the editorial board of Dissent, I am not sure she is the best medium for channeling Karl Marx. It is a bit like reading an op-ed piece by Richard Dawkins on what lessons Marxists can draw from Islam. Despite Sheri Berman’s erudition as a Barnard professor, which certainly must entail an ability to quote chapter and verse of Karl Marx, she seems mainly dedicated to convincing the world that he is a 19th century relic—a theme unsurprisingly that serves as the backbone of her op-ed piece. In 1848, workers joined with liberals in a democratic revolt to overthrow the French monarchy. However, almost as soon as the old order collapsed, the opposition fell apart, as liberals grew increasingly alarmed by what they saw as “radical” working class demands. Conservatives were able to co-opt fearful liberals and reinstall new forms of dictatorship. Those same patterns are playing out in Egypt today — with liberals and authoritarians playing themselves, and Islamists playing the role of socialists. Once again, an inexperienced and impatient mass movement has overreached after gaining power. Once again, liberals have been frightened by the changes their former partners want to enact and have come crawling back to the old regime for protection. And as in 1848, authoritarians have been happy to take back the reins of power. Faced with the prospect of substantial public resistance to his scheduling of a referendum on a Muslim Brotherhood-tinged constitution on December 15, Egyptian President Muhammad Morsi has turned to the military. (The green in the title is a reference to political Islam, not the environment). Morsi has ordered that the Egyptian army guard government buildings (and presumably the offices of his own party, Freedom and Justice, which have been being attacked by protesters). They spent Sunday putting up a blast wall around the presidential palace in Heliopolis, Cairo, which protesters invaded last Tuesday. He also gave the military what he said were temporary powers to arrest civilians. Mammoth tasks lie ahead for Egypt’s new, democratically elected civilian authorities. They will need to change how the state-owned commercial sector and public enterprises work in order to unlock the national economy’s potential for sustained and equitable growth. Despite her familiarity with Marx’s writings (am I assuming too much? ), Berman has a tendency to overlook class criteria when making her argument. For example, she writes about the 1848 events: “When it became clear that workers and socialists might win, liberals balked, and many of them turned back to the conservatives, seeing the restoration of authoritarianism as the lesser of two evils.” When she refers to “liberals” balking, you have to ask what that means in class terms. Let me be more specific. Corey Booker would describe himself as a liberal; so would many Black working-class voters in New Jersey. But when push comes to shove, Booker will defend the interests of big capital. Ultimately, what counts in Marxism is a class analysis—something Professor Berman seems averse to. The 1848 fiasco strengthened the radical elements of the socialist movement at the expense of the moderates and created a poisonous and enduring rift between liberals and workers. After liberals abandoned democracy, moderate socialists looked like suckers and radicals advocating a nondemocratic strategy grew stronger. In 1850, Marx and Engels reminded the London Communist League that they had predicted that a party representing the German liberal bourgeoisie “would soon come to power and would immediately turn its newly won power against the workers. You have seen how this forecast came true.” They went on to warn, “To be able forcefully and threateningly to oppose this party, whose betrayal of the workers will begin with the very first hour of victory, the workers must be armed and organized.” This is not the lesson anybody wants Islamists to learn now. Perhaps it is just a function of trying to pack several years of history in a single paragraph that yields an abundance of confusion or perhaps that was Berman’s intention to start off with. We see a kind of reductionism with “radicals” endorsing violence and liberals abandoning “democracy”. In reality, the situation after 1848 was a lot more complex. Those who fought against absolutism were united in their commitment to democracy—a tautology that is worth emphasizing. In the bourgeois reign of terror that followed the defeat of the movement, many democrats fled Germany in the same fashion that Pinochet’s coup produced a tidal wave of émigrés. They became known as “48’ers” and included Joseph Weydemeyer in their ranks. Weydemeyer, a Marxist, came to the United States and began publishing socialist periodicals. General John C. Frémont recruited Weydemeyer to the Union army on the strength of his background as a Prussian military officer. Under Frémont’s command, Weydemeyer supervised the erection of ten forts around St. Louis and then went on to become a lieutenant colonel commanding a Missouri volunteer artillery regiment that fought Confederate guerillas in southern Missouri in 1862. So what do we make of Joseph Weydemeyer? In the U.S. he pretty much followed the same course that Marx advised to the London gathering of German exiles in 1850: to arm the workers and be organized to fight for democracy. Democracy, of course, in Marxist terms means the rule of the majority—the same thing indicated by its Greek origins. Democracy means rule by the people—the demos. For Berman, it means one thing and one thing only: to participate in elections even if big capital has the right to guarantee the outcome through its stranglehold over the outcome on the basis of its disproportionate wealth. Even on the basis of this criterion, the Marxists in Germany decided to put the armed struggle on the back burner once the situation after 1848 had stabilized. Through its class appeal to the overwhelming majority of society, the German social democracy went from strength to strength. No matter if it had been capable of taking control of the state and peacefully leading a transition to socialism, this would have not assuaged Berman’s obvious distaste for such a “radical” outcome. Her preference was for Eduard Bernstein’s implicit partnership with the German ruling class. In the name of socialism, it was as unprincipled in its way as the Muslim Brotherhood’s alliance with the Egyptian military. In an interview with PBS, Berman described Bernstein’s breakthrough: “He saw classes that did not have the kind of conflicts that Marx and Engels predicted, and more importantly seemed to be able to work out many of their differences by using the political system.” In other words, get a PhD, work for a prestigious institution like Barnard, and write meretricious think pieces for the NY Times, the newspaper no real estate baron or hedge fund manager could live without. There is a great deal of sound evidence to support the view that, in the present state of public opinion in Europe, the subjection of natives to the authority of European administration does not always entail a worsening of their condition, but often means the opposite. However much violence, fraud, and other unworthy actions accompanied the spread of European rule in earlier centuries, as they often still do today, the other side of the picture is that, under direct European rule, savages are without exception better off than they were before. Am I, because I acknowledge all this, an ‘adulator’ of the present? If so, let me refer Bax [Belfort Bax, the British socialist who denounced Bernstein as an apologist for colonialism] to The Communist Manifesto, which opens with an ‘adulation’ of the bourgeoisie which no hired hack of the latter could have written more impressively. However, in the fifty years since the Manifesto was written the world has advanced rather than regressed; and the revolutions which have been accomplished in public life since then, especially the rise of modern democracy, have not been without influence on the doctrine of social obligation. A century after 1848, social democrats, liberals and even moderate conservatives finally came together to create robust democracies across Western Europe — an outcome that could and should have happened earlier and with less violence. Middle Eastern liberals must learn from Europe’s turbulent history instead of blindly repeating it. The first months of 1948 were entirely dedicated to the election campaign. Never again, in the whole history of the Republic, was a campaign to be fought so bitterly by both sides, or to be influenced so heavily by international events. American intervention was breathtaking in its size, its ingenuity and its flagrant contempt for any principle of non-interference in the internal affairs of another country. The US administration designated $176m of ‘Interim Aid’ to Italy in the first three months of 1948. After that, the Marshall Plan entered into full operation. James Dunn, the American ambassador at Rome, made sure that this massive injection of aid did not go unobserved by the Italian general public. The arrival of every hundredth ship bearing food, medicines, etc., was turned into a special celebration. Every time the port of arrival was a different one — Civitavecchia, Bari, Genoa, Naples — and every time Dunn’s speech became more overtly political. Whenever a new bridge or school or hospital was constructed with American help, there was the indefatigable ambassador travelling the length of the peninsula to speak in the name of America, the Free World and, by implication, the Christian Democrats. Often the goods unloaded from the ports would be put on a special ‘friendship train’ (the idea was the American journalist Drew Pearson’s) and then distributed with due ceremonial at the stations along the line. And just in case the message was not clear enough, on 20 March 1948 George Marshall warned that all help to Italy would immediately cease in the event of a Communist victory. If all else failed there was always military intervention. The American government studied various plans of action in the event of the Popular Front’s victory. Truman hoped to convince part of the Socialists to destroy the unity of the left, but if this did not succeed there were proposals for encouraging an anti-Communist insurrection, with financial and military assistance to clandestine groups, and for the direct military occupation of Sicily and Sardinia. As it was, the Americans strengthened their Mediterranean fleet, and in the weeks preceding the election their warships anchored in the waters of the main Italian ports.